This article originally appeared on Pinstripe Alley. Read the original here. 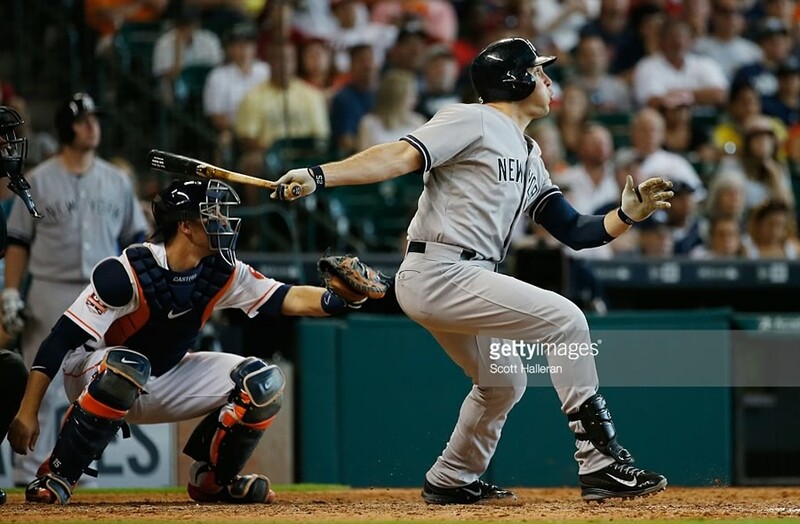 Depending on which stat column you look at, it’s a bit difficult to tell what kind of start Yankees first baseman Mark Teixeira is off to so far in the very early goings of 2015. Some numbers point to a great resurgence, while others point to the same old Tex. Let’s delve a little bit deeper into the numbers and see what’s been going on with the slugger from Annapolis, MD. First of all, it should be noted that Tex came into camp trumpeting a new diet and workout regiment that had him in feeling great and healthier than he had in years. It should also be noted, however, that just about everyone to ever report to spring training – especially older guys coming off of a bad season – has pretty much said the same thing. However, the one thing Tex said was that he felt stronger, which I think we can all see right off the bat, pun intended. Tex certainly looks better than he has in a while, so he passes the eye test at least. Now, let’s get into the numbers. If I were to tell you that Tex had just 10 hits in the team’s first 16 games (15 for him), and he was only hitting .196, you’d probably say this was either another typically slow start by him, or that the 35-year old was clearly nearing the end of his major league run, right? He hit .216/.313/.398 last year, so you’d probably be leaning more towards the latter of those two scenarios too. I know I would be. But guess what? We’d both be wrong about his start to 2015, because, despite the low batting average, Tex is getting on base at a great clip, and hitting the ball with a ton of authority when he’s able to make contact. You can see an example in this video. The first thing that I think we need to examine actually has nothing to do with even hitting the baseball. Tex has drawn 11 walks in his 65 plate appearances, which at 16.9%, would be the best walk rate of his career (previously 14.2% in 2008). Now, I’m not saying that percentage will keep up, and Tex will walk 118 times this year, but it’s fair to say that his increased patience means that he’s been more able to wait for good pitches to hit. He’s also striking out way less this season (16.9% K rate) than he was last season (21.5% K rate), and is even below his career mark of 17.5%. All of those numbers mean that he’s being more patient and making better contact when he does swing at pitches that tickle his fancy. As a result of all of this, Tex has nine extra-base hits so far this season. That’s right, he has only one single so far. Whenever he’s hit the ball, he’s been mostly chugging to second for one of his four doubles, or trotting around the bases on one of his five home runs. All those extra base hits and walks have built his OPS to a very robust .892, a number he hasn’t sniffed in a few years now. Not only that, but Tex has been driving in important runs with his hits. Three of his five homers have either tied the game – like the one he hit off of Steven Wright in the video above – or given the team a lead. Overall, he has driven in 13 runs on the young season, which would put him on pace for about 131 on the year. His ISO is at an absurd .388! To put that in perspective, in his absolute prime, he topped out at .279. Again, I do not, in any way, think these numbers could ever actually hold up, just like I don’t think he’ll end up with the 50 dingers he’s on pace for, but it’s just nice to see him showing some life and getting big hits. Getting back to a negative stat, let’s take a look at the most curious part about Mark Teixeira’s season so far – his BABIP (batting average on balls in play). Because home runs (like the one against the Tigers above) don’t count as being in play (which seems kind of dumb to me, but whatever), Tex’s BABIP currently sits at .131. I don’t think I’ve ever seen that kind of difference from BABIP to batting average, at least not where the BABIP is the lower number. If you add the home runs back into the equation, which I think we should, his BABIP goes back up to .263, which is right about what you’d expect his batting average to be for the season at this point in his career. However, if he’s going to hit .263, his BABIP should be higher. BABIP usually is, because putting the ball in play is the only way to get hits, right? There are a couple of reasons why Tex’s BABIP is as low as it is. It could either be that he’s no longer hitting the ball with authority, like we’ve seen from Carlos Beltran so far this season, or that he’s had some bad luck. When you consider all the extra-base hits Tex has mashed – many of which have actually hurt his overall BABIP, oddly enough – it’s probably not the former. With some good luck, Tex’s numbers could get even better than they have been, which would be nice. One other thing to note about the Tex’s season so far: It’s in line with a few of his teammates. Stephen Drew is only hitting .178, but he’s hit 4 homers; Alex Rodriguez has struggled a bit the last few games so, despite his 4 homers, he’s only hitting .265. Overall, the team has 21 homers in 16 games, and they’re only hitting .246 as a team. It’s hard to judge anyone’s season so far. Is this a team that’s having bad luck on balls that don’t go over the fence, or is this a team of Adam Dunns? I have no idea, but, at least so far in the very early going, it’s working. What do you think about Teixeira’s season so far, Pinstripers?